In Ways Big And Small, Saudi Arabian Women Are 'Pushing Normal' : Parallels It can be a provocative art show. Or teenagers going out for a walk. By law and tradition, Saudi women still face many restrictions. But they keep stretching the boundaries and the pace is picking up. 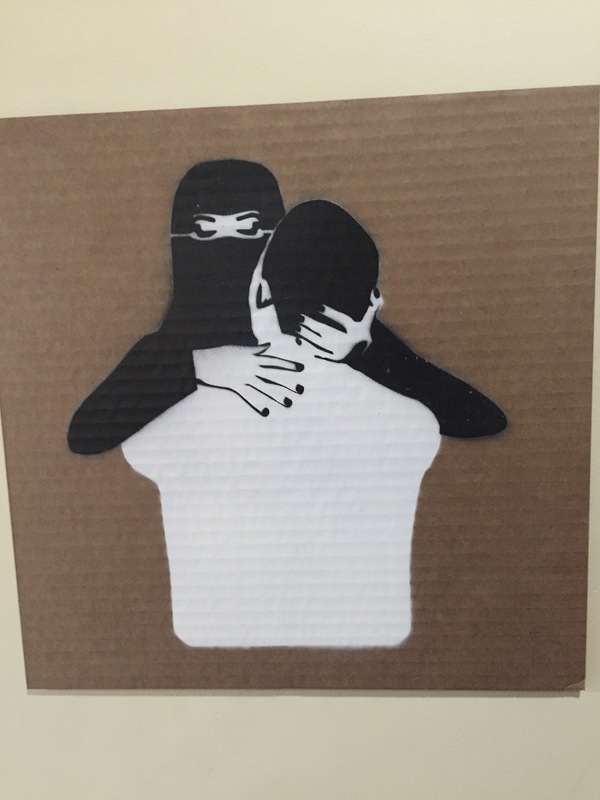 A veiled woman and a man embrace in this work by Mohammed Labban at the recent art exhibition "LoudArt," an annual event in the Saudi Arabian city of Jeddah. The exhibit, curated by a woman, often challenges conservative traditions in the kingdom. I first saw Saudi Arabian women "pushing normal" before I knew this concept had a name. I was walking down Tahlia Street in the Saudi capital, Riyadh. It's a trendy weekend hangout spot, a strip of fast food burger and brand name coffee shops popular with young Saudi men. It was striking to see three young women stride down this all-male domain defying the kingdom's conservative social codes enforced by the religious police and the judgments of family and neighbors. "But if we listen to them, stay home, and not enjoy our lives, it's going to be like this forever," says Sadeem, age 17. Her friends, Amira, 18, and Yasmin, 16, nod in agreement, though none reveal their last names. It's risky, they acknowledge, in a country that prohibits men and women mixing in public. Still, these high school students insist that Saudi Arabia is changing fast. "For example, we are out here right now," says Sadeem. "A few years ago that would be impossible. There is no way that a girl our age could walk around and have a normal life. " They are making a point in this nighttime walk. "Yes, basically," says Yasmin. It is "pushing normal" for this trio of rebellious teenage girls. When I ask if their parents know they are out there, they give a nervous laugh. "They would say, 'You are ruining your reputation,'" says Amira. "But it's so not important. We are just walking on the street." Saudi Arabia is one of the most repressive places to be female. Yet, there are successful female executives, engineers and even a female executive editor of a major Saudi newspaper. Still, because of an official ban, none of them can drive to work. These are just some of the contradictions in a notoriously conservative society, where women are pushing the boundaries, especially among the young. 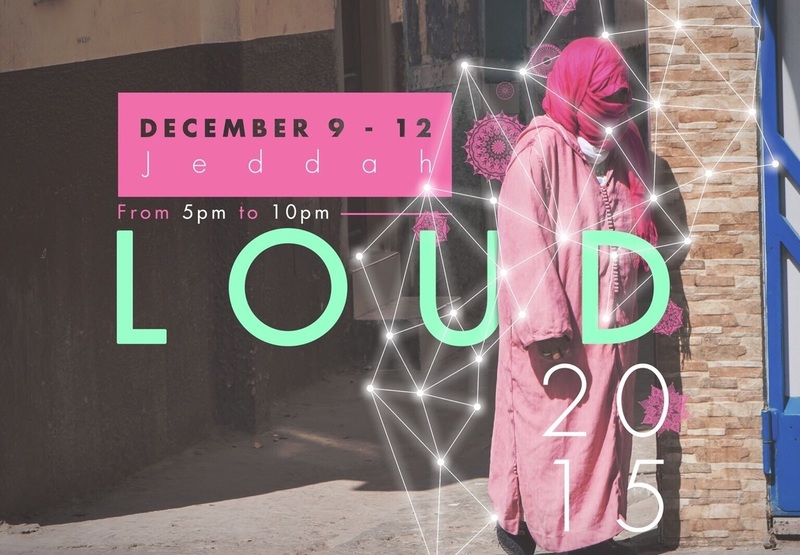 The advertising poster for "LoudArt," an annual cultural event and art exhibit in the Saudi city of Jeddah. The program reflects the efforts by young Saudi women to expand their role in public life. "It's a cultural clash that our generation is experiencing," says Raneen Farid Bukhari, 28, who organizes a yearly art show in Jeddah, on the coast of the Red Sea. She points to the boom in social media in the kingdom that has opened the door to the wider world and spurred a social revolution among a wired generation. "With social media, and with TV and with movies, the more and more you watch, the more you're like, 'Why isn't my life that way, it's freer, you know.'" Bukhari is the co-founder of "LoudArt," an annual cultural event that encourages young Saudi artists. They visualize controversial themes such as gender issues, freedom and an identity crisis, says Bukhari, "between what is labeled as Western and trying to be traditional and Islamic." For Bukhari, "pushing normal" is an art show where Saudis, men and women, mix to look at art and discuss ideas. A veiled woman with fries, from the "LoudArt" exhibit in Jeddah, Saudi Arabia. The piece is by Mohammed Labban. The art is quirky and sometimes funny. 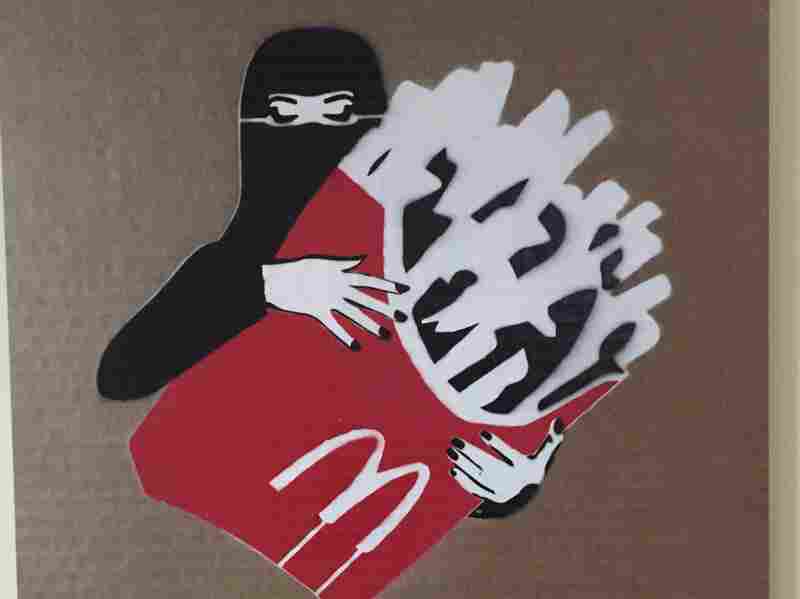 In one print, a fully veiled woman embraces a package of McDonald's fries. As the mixed crowd walks through the gallery, one young man plays live music. He is sitting next to a toy model of Darth Vader. The artistic themes are serious, too, about the anxiety of change and the pace. Too slow for some, says Bukhari. "Small things, like walking on the streets, or having art shows, these are things we can do," she says. "We want to make things normal. It's something that's normal in other places." It's a challenge to Saudi Arabia's traditional culture, she says, a challenge coming from international culture that arrives on social media as well as the thousands of Saudis who are now educated abroad, many in the West, who want to bring some of that lifestyle home. A walk on the street is progress, so is an art show now in its fourth years. It's all "pushing normal," says Bukhari, and there are more challenges ahead. "My friend rides a bike, but she does it at 4 or 5 in the morning and she dresses like a boy," says Bukhari, "and she does it because she wants to ride a bike. So, we just want it to be normal. That's it."